Tons of private parties and events…. The Comedy Hypnosis Show is great entertainment for grad nights, assemblies, project graduation, homecoming, post prom, senior breakfast and school fundraisers. 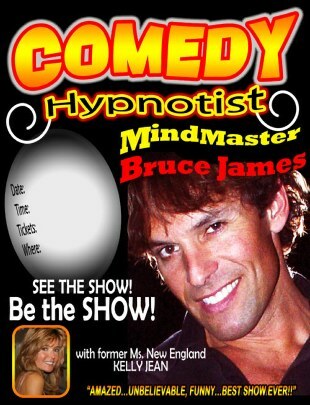 Comedy Hypnotist Bruce James provides outstanding entertainment that is fun and appropriate. See the student volunteers become the stars of this inspiring show! Bruce James has performed coast to coast in over 35 states for hundreds of schools. He and his assistant, Kelly Jean (former Miss New England), provide a quality adult comedy hypnosis show that is classy and entertaining. - We will customize the show to meet your schools needs. - If your interested is in fund raising you name your cause, and we'll help the school raise money!! We have a fundraising guidebook to help you succeed. The kids have fun selling tickets as they feel that this is "their" night of fun. When the show starts, I state to the studens what's going to happen and explain that hypnosis is a natural state of mind that happens to everyone, everyday at least twice. I tell them what they can expect and let them know I'm not going to make them cluck like a chicken... I will have fun with them... but always have the intent to inspire my volunteers. Then we get the students attention with some suggestibility tests while they are seated in the audience. We then ask for volunteers. By now, the students have gained my trust and we easily fill up 15 to 20 straight back chairs. The induction last approx 5 to 6 minutes. This is when the fun begins. The volunteers are transformed into dancers, musicians, regressed to 6 years old, speak fluent foreign languages and much much more. The content and presentation is always done tastefully and with respect and is designed to unite the students with an experience they will never forget. Mostly, those that had disbelief, become believers as they see their friends and acquaintances on stage like they have never seen them before. Fun and learning is always a great combination. We often end the show with post hypnotic suggestions that bring the volunteers to life again (that have returned to the audience) doing celebrity performances i.e. Elvis, Justin Beiber, Taylor Swift or Katie Perry! At the end of the show, we can use the sound equipment to make any announcements or further communication to the students. What schools are saying . . . Thank YOU for such a great performance yet AGAIN!!!!! You were a total success. 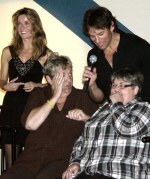 It was my pleasure to right a review for you and I can't WAIT to get the dvd!!!! I already had one of my guests ask for your phone number!!!! and I think it would be awesome to have you there this year to entertain my students. and it was a pleasure meeting her also. Talk to you in the near future. Dear Bruce, The kids loved the show! So glad you could join us and make the day memorable! for your excellent show at our school on Thursday May 26th, 2011.
and appreciate your flexibility to meet our budget and time restrictions. positively reinforcing their hard work. Your show was outstanding. The students and staff laughed so much and continued to talk about it for days. to you and your assistant for your performance. Sincerely, Amesbury Middle School EAST teachers and Students.